Vacations are made for getting away; a time of refreshment and relaxation. I usually take time away around the Holidays as a time of reflection, also. Looking back on the previous year without a calendar contolling my time gives me fresh eyes to review my accomplishments. Sometimes, though, vacations remind you of home. Vacations are about memories too! This year we are in Phoenix – although I moved back home to Indianapolis, from Phoenix – you can’t beat Phoenix in the wintertime. This year Chihuly has a handblown glass display at the Desert Botanical Gardens, which is absolutely beautiful. We decided to go for a tour on New Year’s Day. It was a gorgeous sunny day. With the sun dancing off the glass sculptures, it really added color and light to the desert. So, why did this beautiful day remind me of Indianapolis? When the Chihuly glass display opened at the Indianapolis Childrens Museum, we took our grandkids (and our children) for a wonderful day of fun. Check out the fun the kids and grown ups alike can have learning about the masterful craft and art of handblown glass. Although the Phoenix display is temporary, the Chihuly glass display at the Childrens Museum is a permanent display. I wish I could bring back some sunshine and warm weather to Indianapolis! 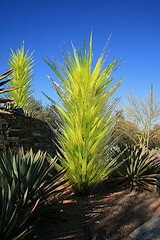 I’d like to share the pictures we took of the Desert Botanical Gardens. I hope you enjoy them. Here’s a tour of the natural beauty of the Sonoran Desert sans the glass. What a beautiful botanical garden! I would love to go visit it. And a hand blown glass display as well! I have visited many botanical gardens and enjoy them. Stay warm up there in Indy! I really enjoy reading Vacation Thoughts of Home | Indianapolis Real Estate and Homes for Sale . It's very interesting. Hope you will post something like this again.